Louisa Adams, wife of John Quincy Adams, was the first foreign-born First Lady of the United States. A native of London, Louisa was literate, a fashionable dresser, and had Continental polish and charm from many years spent in Europe. Most importantly, she understood how to use her social skills to make up for her husband’s inadequacies. In 1815, Louisa Adams made a dangerous journey across Europe to join her husband in Paris, in which she encountered the effects of the Napoleonic Wars firsthand. 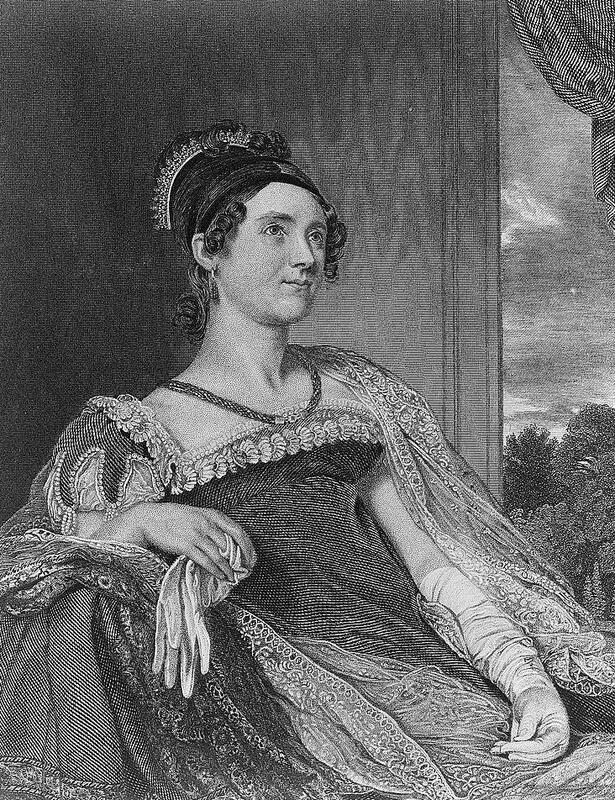 Louisa Catherine Johnson was born in London on February 12, 1775, to an American father – Joshua Johnson, a Maryland merchant residing in London – and an English mother, Catherine Nuth. The second of eight children, Louisa grew up in London and in Paris, where her family took refuge from 1778 to 1783, since her father sided with the Patriots during the American Revolution. In consequence, Louisa spoke French fluently. Louisa’s father interceded and the couple was married on July 26, 1797, at the Church of All Hallows by the Tower in London. Instead of Portugal, Adams was posted to Prussia. He and Louisa lived in Berlin for four years. In 1801, they moved to Massachusetts, where their three sons were born: George in 1801, John in 1803 and Charles Francis in 1807. In 1809, Adams was appointed the first ever United States minister (ambassador) to Russia. Louisa and Charles accompanied him to St. Petersburg. Young George and John were left to be schooled in the United States, under the care of Adams’ parents. Adams made this decision without consulting Louisa, who was understandably distraught when she found out. Some of Louisa’s episodes of ill health were occasioned by pregnancies and miscarriages. When Adams wrote the above passage, Louisa was eight months pregnant with their daughter, also named Louisa, who was born on August 12, 1811. Sadly, the little girl died a year later, on September 15, 1812. In April 1814, John Quincy Adams was summoned to Belgium to take part in the United States negotiations with Britain to end the War of 1812. When the Treaty of Ghent was completed, he moved to Paris to await official notice of his new appointment as the US minister to Great Britain. He wrote to Louisa, inviting her to join him. On February 12, 1815, Louisa Adams began a harrowing 2,000 mile journey from St. Petersburg to Paris with 7-year-old Charles, a governess and two servants. Retracing, in places, the route Napoleon’s Grande Armée had taken during its retreat two years earlier, Louisa found signs of the Napoleonic Wars everywhere. By the time Louisa reached Strasbourg, she was exhausted. While Louisa Adams was making her way across the continent, Napoleon escaped from exile on Elba. He too was headed for Paris. Once in France, Louisa’s little group, in its Russian carriage, found themselves in the midst of Imperial Guards hastening to join the Emperor. Mistaking them for Russians, the soldiers threatened to tear Louisa and her party out of the carriage and kill them. Louisa presented her passports to an officer. He told the troops she was an American going to meet her husband in Paris. 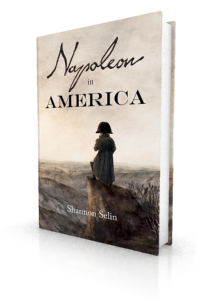 The soldiers shouted, “Vive les Americains!” They wanted her to cry “Vive Napoléon!”, which she did, waving her handkerchief out the carriage window. (7) The undisciplined troops accompanied Louisa to the next post house, with orders to fire if the carriage went any faster than a walk. “In this way we journeyed; the soldiers presenting their bayonets at my people with loud and brutal threats every half hour. The road lined on each side for miles with intoxicated men, rife for every species of villainy, shouting and vociferating: ‘Á bas Louis dix huit! Vive Napoléon!’” (8) A rumour spread that she was one of Napoleon’s sisters hurrying to join him. On May 23, 1815, John Quincy and Louisa Adams left France with Charles for a two-year stay in London, which they both loved. Their sons George and John, whom Louisa had not seen for six years, joined them. In 1817, they returned to the United States, where John Quincy became secretary of state. Louisa applied herself to advancing his career. 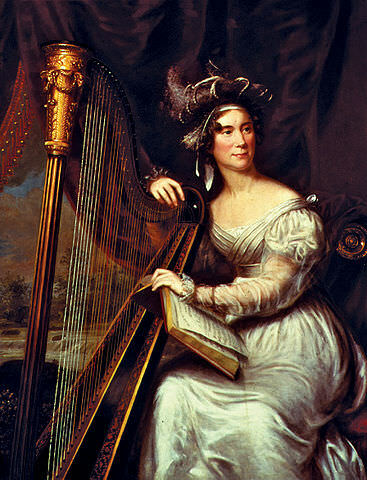 Though she was by nature timid, Louisa Adams delighted in society and enjoyed entertaining. She regularly gave dinner parties for members of Congress. In early 1820, she started hosting Tuesday night “sociables,” to which women were also invited. These were large parties – the first attracted some 200 guests – complete with food, card-playing, music and dancing. As we see at her sociable in Napoleon in America, Louisa often provided entertainment herself. She had a good singing voice and played the harp and the piano. In addition to being a regular source of fun during the Washington winters, Louisa’s sociables served the political purpose of winning friends and allies for her husband. Introducing a social innovation, Louisa added a subscription aspect to her gatherings. Guests were invited not to a single occasion, but to a whole series of sociables. Those accepting the invitation were expected to attend only that set of parties throughout the season. Though other Cabinet families imitated her, Louisa’s events remained the most popular. The Adams’ home on F Street ranked with the White House as a social centre. Despite his protests, John Quincy Adams wanted the presidency. Louisa Adams fully supported his quest. In the run-up to the 1824 presidential election, they calculated that hosting a grand ball for Andrew Jackson, on the 10th anniversary of his victory at the Battle of New Orleans, would be a coup. Louisa threw herself into preparations. She cleared the furniture out of two stories of the house. She took doors off their hinges and rearranged the rooms, turning John Quincy’s library and study into a ballroom. She had pillars installed to prop up the second floor, where dinner would be served. She wove garlands and wreaths, designed patterns to be chalked onto the dance floor, and hired members of the Marine Band to play. To guide the way to the house, bonfires were lit for two blocks around. Unfortunately, Jackson himself decided to enter the 1824 presidential campaign. He won a plurality of the electoral votes, but not enough to prevent the election going to the House of Representatives to make the final decision. The House elected John Quincy Adams president, after Henry Clay (the third leading candidate) threw his support behind Adams. Louisa was too ill to attend her husband’s inaugural ball. For Louisa Adams’ life as First Lady (1824-1829) and afterwards, see her biography on the National First Ladies’ Library website. Louisa Adams died of a heart attack in Washington on May 15, 1852, at the age of 77. She is buried beside her husband in the United First Parish Church in Quincy, Massachusetts. Worthington Chauncey Ford, ed., Writings of John Quincy Adams, Vol. 2 (New York, 1913), p. 109. Charles Francis Adams, ed., Memoirs of John Quincy Adams, Vol. 2 (Philadelphia, 1874), pp. 282-83. Brooks Adams, ed., “Mrs. John Quincy Adams’s Narrative of a Journey from St. Petersburg to Paris in February, 1815,” Scribner’s Magazine, Vol. 34 (July-December 1903), p. 453. Proceedings of the Massachusetts Historical Society, Vol. 19 (Sept. 1881), p. 28. Memoirs of John Quincy Adams, Vol. 5, p. 305. Catherine Allgor, Parlor Politics: In Which the Ladies of Washington Help Build a City and a Government (Charlottesville and London, 2000), p. 180. Proceedings of the Massachusetts Historical Society, 19 (Sept. 1881), p. 40. Very interesting! Has Louisa’s narrative of her journey to Paris ever been published in bookform?? Or would it be possible to get a photocopy of her narrative, published in Scribners magazine?? I would love to have the whole text! BY THE WAY,a descendant of John Quincy Adams was a painter who did a lot of VERY good paintings and portraits of the Viennese high society,including the last Austrian Emperor. Thanks, Irene. You can get a free copy of the Scribner’s Magazine issue in which Louisa’s account of her journey was published here: https://archive.org/details/scribnersmagazin34newy. This was used as the basis for a book called Mrs. Adams in Winter: A Journey in the Last Days of Napoleon, by Michael O’Brien (2010). Excellent historical details. Linkedin mentioned politics. No politics here, only historical science. Mrs. Adams is, on the whole, a very pleasant and agreeable woman; but the Secretary has no talent to entertain a mixed company, either by conversation or manners.